The words “Pleasure Beach” typically bring to mind the famous amusement park on Blackpool’s seafront, which opened in 1896 and remains one of the UK’s most popular tourist destinations. However, there is another historic attraction of the same name that is equally worthy of a visit. Great Yarmouth Pleasure Beach remains the Suffolk, England resort’s biggest draw, and has managed to remain relevant despite having been in operation for over a century. The parallels between Great Yarmouth Pleasure Beach and the (unrelated) Blackpool version don’t end with the identical names. Both are located in coastal towns that have suffered from a decline in visitor number since their mid-20th-century heydays, but have managed to avoid the bankruptcy and arson that caused the downfall of similar attractions all over the world. Both have also managed add contemporary rides on regular basis, while continuing to retain the feel of a typical seaside funfair. This enables them to be enjoyed either as just another amusement park, or as a kind of living, working museum. While Blackpool is home to a number of major roller coasters, Great Yarmouth Pleasure Beach features just one. 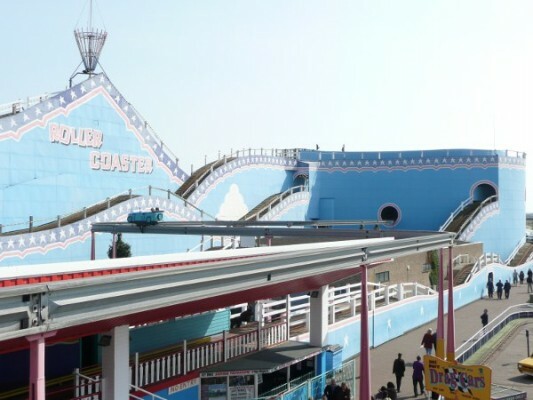 However, its Scenic Railway is now completely unique in the UK, being the only ride of its type that remains operational (at least until the one at Margate’s Dreamland can be restored). Relocated from the 1929 Paris Colonial Exhibition and installed in 1932, it utterly dominates the park and remains its most thrilling attraction by some distance. This is a testament both to original engineering of coaster and to subsequent maintenance work, which ensures that it is still surprisingly smooth to ride. With no brakes built into its circuit, employment is provided for a brakeman who must bring the train to a halt when it completes its circuit. 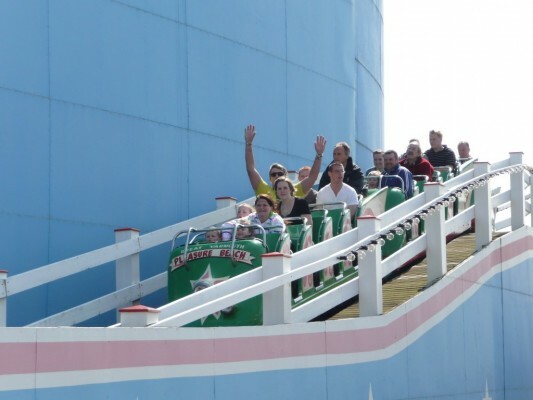 While the Scenic Railway is the undoubted highlight, fans of classic rides will find plenty of other distractions at Great Yarmouth Pleasure Beach. 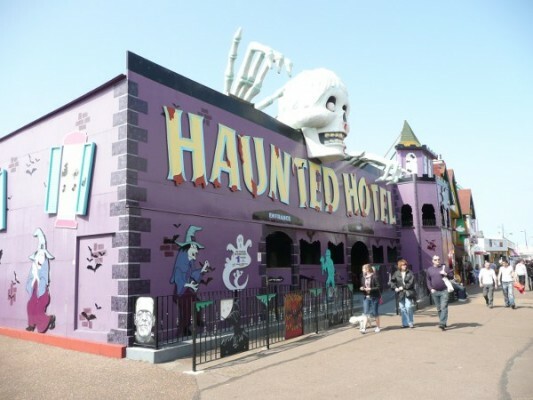 In addition to traditional fare such as dodgems, a ghost train (the “Haunted Hotel”) and a carousel, the park is home to a number of other rides that are carry-overs from generations gone by. Particularly enjoyable is the rickety Monorail, which snakes around the edge of the park and even passes through the Scenic Railway on several occasions. Of course, with the park being reliant on drawing families back year-after-year and facing competition from other theme parks in the UK, it has had to expand its range of attractions to feature more up-to-date fare. One of the most popular is the Zamperla Disk’O, cleverly located at Pleasure Beach’s entrance in order to achieve maximum visual impact. Riders board a circular disk, which then spins rapidly as it glides up and down a U-shaped track. In 2010, Pleasure Beach joined the current fad for “4-D” attractions, adding a small theatre that shows animated movies and uses shaking seats and water effects to create a sense of immersion. It even hosts a clever twist on traditional “grand prix” car rides, with guests able to race each other on gravity-defying Segway vehicles instead of go-karts. Entry to Great Yarmouth Pleasure Beach continues to be free, so history buffs can enjoy a stroll around the park at no cost. For those that want to experience the rides, there are two options. They can be enjoyed on a pay-per-ride basis, with prices scaling up to £3 for the most popular attractions such as the Scenic Railway. Alternatively, wristbands offering unlimited rides can be purchased for between £16.50 and £19.50 depending on the time of year. Nick Sim is the editor of Theme Park Tourist, which features all the latest theme park news and reviews.